Part 1 Welding technology and design to prevent weld cracking: Selection of weld-crack resistant stainless steels; Robust welding technologies for ferrous alloys; Design against cracking in ferrous weldments; A discussion of the current procedures for design of welds against fatigue. Part 2 Weld crack behaviour, evaluation and repair: Mechanical behaviour of stainless steel, ferritic steels welds and weld joints; Fracture toughness in the design and operation of ferrous weldments; Testing and evaluation of weld cracking in ferrous alloys; Lessons learnt from failures in ferrous weldments; Cracking in high-performance superduplex stainless steel welds; Weld metal cracking in cellulosic girth welds of pipelines; Repair of weld cracks; Measurement of residual stresses in weld repairs in steels. Part 3 Environment-assisted weld cracking: Corrosion issues in ferrous weldments; Advances in techniques for determination of susceptibility of welds to stress corrosion cracking (KISCC); Less explored types of environment-assisted cracking of welds: Industrial issues and research opportunities. Weld cracks are unacceptable defects that can compromise the integrity of welded structures. Weld cracking can lead to structural failures which at best will require remedial action and at worst can lead to loss of life. 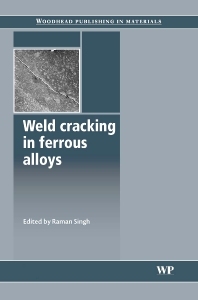 Weld cracking in ferrous alloys reviews the latest developments in the design, evaluation, prevention and repair of weld cracks. Part one reviews the fundamentals as well as recent advances in the areas of welding technology, design and material selection for preventing weld cracking. Part two analyses weld crack behaviour, evaluation and repair of cracking/cracked welds. The book benefits from an extensive and robust chapter on the topic of NDE and quality control that was contributed by one of the most respected non-destructive evaluation and development groups in the world. Part three covers environment assisted weld cracking. With its distinguished editor and international team of contributors, Weld cracking in ferrous alloys is a valuable source of reference for all those concerned with improving the quality of welding and welded components. In the planning and development of this book, particular care has been taken to make the chapters suitable for people from other disciplines who need to understand weld cracking and failure. Dr Raman Singh is an Associate Professor in the Department of Chemical Engineering and Department of Mechanical and Aerospace Engineering at Monash University, Australia.